This time we're venturing beyond Europe to visit the West Bank of the Jordan River — a land its residents call Palestine. After visiting Jerusalem, we harvest olives near Ramallah, follow pilgrims to the site of Jesus' birth in Bethlehem, approach Abraham's tomb — as both Jews and Muslims do — in Hebron, join friends for dinner, and bob in the Dead Sea. We'll also learn about walls, Israeli settlements, and the challenges facing this region. Hi, I’m Rick Steves, back with more travels. This time we’re venturing beyond Europe…delving into the Muslim and Arab half of the Holy Land. This is Palestine. Our goal: to walk in the footsteps of the people who live here. Thanks for joining us. 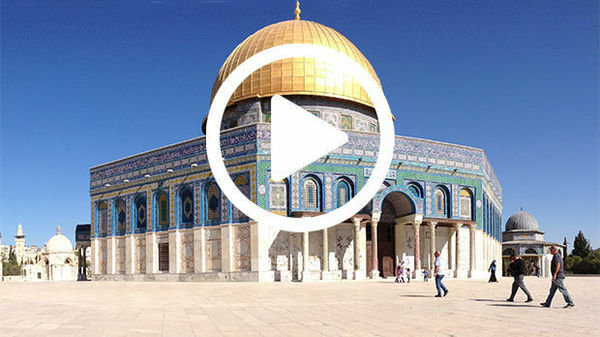 This time we visit the West Bank of the Jordan River — a land its residents call “Palestine.” While Israelis and Palestinians have overlapping claims and struggle to share it peacefully, the West Bank has a rich and fascinating heritage well worth exploring. We’ll visit Jerusalem — sacred to Christians, Jews, and Muslims — and considered by Palestinians to be their historic capital. We’ll harvest olives, drop in on friends for dinner, follow pilgrims to the place of Jesus’ birth, bob in the Dead Sea, hike to an ancient monastery deep in the desert, and feel the energy of an emerging economy. Along the way, we’ll learn about walls, settlements, and the challenges facing this region. In the Middle East, Israel and Palestine share the land west of the Jordan River. Israel is the predominantly Jewish State, while Gaza and the West Bank are Palestinian — mostly Muslim and Arab. In the West Bank, we’ll travel from Jerusalem to Bethlehem, then Hebron, through the Judean Desert to the Dead Sea, before finishing in Ramallah. We’ll visit Israel in another episode. And the difficult issues Palestinians and Israelis are grappling with over this contested land are beyond this scope of this travel program. And, I know, just talking about this place upsets some people. I’m aware of that, but, I’m a travel writer, and that’s what I do. While there are no easy answers, actually coming here and learning first-hand is the best way to gain context and understanding. 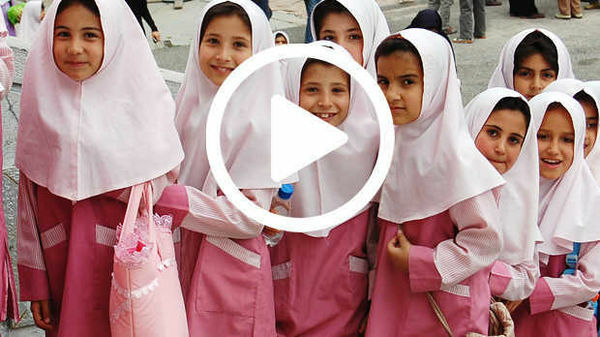 I can learn about Islam on the carpet of a mosque, get tips on roasting coffee, and gain insight into how a proud and independent young woman chooses to cover her head. People from all walks of life are happy to talk, the welcome’s warm, and travel here is richly rewarding. The Muslims and Jews who call this region home share a family tree that goes back nearly 4,000 years. That’s when the patriarch, or prophet Abraham had two sons. From Isaac came the Israelites, and Ismael spawned the Arabs. This ancient ethnic mix is complicated by religions. Israelites were Jewish. Christians worship Jesus, a Jew who brought his own message. And today, most Arabs here are Muslim — a religion that arrived much later with their prophet, Mohammad, in the seventh century. Throughout the centuries, this region endured waves of conquerors, from Roman legions to Christian Crusaders to Muslim Ottomans. In the 19th century the entire area was called “Palestine” — a name that goes back to Roman times. A century ago, Arabs vastly outnumbered Jews. That changed in the 20th century with the creation of the state of Israel. Today, the combined population of Israel and Palestine is about 12 million — roughly half Jews and half Arabs. In 2012 the United Nations recognized Palestine as a state. The epic stories of the world’s three great monotheistic religions have played out on this tiny piece of real estate. It’s been a difficult mix. And Jerusalem is the most contested city within this contested land. The importance of Jerusalem rests upon a rock sacred to both religions. The rock is on what Jews call Temple Mount, once the site of their most holy temple. The golden dome upon that rock today is a shrine marking the spot from where Muslims believe Mohammed journeyed to heaven. They’ve worshipped here for 1,300 years. Radiating from this holy spot is Jerusalem’s Old City — divided into four quarters. The Muslim Quarter stretches from the Dome of the Rock, leading into East Jerusalem. This quarter’s bustling and labyrinthine market place caters mostly to Arab and Muslim residents of Jerusalem. Today, on the eve of a Muslim holiday, the market is particularly busy. Poking into back alleys, you’ll find unforgettable scenes. You can feel the community and a timeless passion for life. Like, it may be from the man who’s evangelical about the quality of his falafel. Falafel purveyor: Ahla w sahla. You’re welcome! Enjoy. Falafel purveyor: You’re welcome. Good time, everybody! Ahla w sahla. Palestinians cling to a hope that one day East Jerusalem will be the capital of their independent state. The essence of the seemingly intractable conflict between Israelis and Palestinians is control of the land. And reminders of that ongoing struggle are commonplace. Israeli Jews buy homes deep in Jerusalem’s Muslim Quarter, then festoon them with flags. Israelis are developing settlements — secure and gated communities on the tops of hills — reaching far into Palestinian territory. And there’s the wall. In the name of its security, Israel has built what it calls the “security fence” and what millions of Palestinians think of as an affront to their dignity, and a land grab — as it often encroaches beyond the internationally agreed-upon border and well into Palestine. This struggle has been difficult — with killings and tragedy on both sides. While one man’s terrorist may be another man’s freedom fighter, the fact is, in recent decades, both sides have suffered terribly — Israeli Jews have been killed by Palestinians, and Palestinians have been killed by Israelis. Just across the Israel/Palestine border from Jerusalem stands Bethlehem. Like border towns between rich and poor lands all over the world, each day workers with special passes cross the wall from here for higher-paying jobs in the far more affluent Israel. While most Palestinians can’t cross, foreign visitors generally breeze right through. As long as times are calm, the West Bank’s wide open for the adventurous traveler. You don’t need a visa, the currency is the same as Israel, good guidebooks lead the way, and you certainly won’t find any tourist crowds. Taxis await just across the wall, and in minutes we’re in Bethlehem. No longer just the little town of Christmas-carol fame, Bethlehem is a leading Palestinian city. While beloved among Christians as the place where Jesus was born, it’s now a predominantly Muslim town. Its thriving old center is a classic Arab market. The main square bustles with commerce. And the traffic circle comes with a memorial to locals doing time in Israeli prisons. Here, immersed in a sea of Palestinian people going about their daily lives, preconceptions can be challenged. Bethlehem’s skyline is a commotion of both crescents and crosses — a reminder that the town, while now mostly Muslim, still has many Christians. While all Palestinians are Arabs, not all Palestinians are Muslims. In fact, many are Arab Christians. Nativity Square [Manger Square] marks the center of Bethlehem. The Church of the Nativity is built upon the spot believed to be where Jesus was born. Inside, you feel the history. Emperor Constantine, the first Christian Roman emperor, had this church built in 326. The mosaic floor of that original fourth-century church is about three feet below today’s floor. In the 12th century, that’s 800 years later, Crusaders ornamented much of the nave with paintings and mosaics. A steady stream of pilgrims and tourists come here from all across Christendom to remember that first Christmas, and to pray on the spot where tradition says Jesus was born. Many assume Palestinian or Arab Christians were converted in modern times. But, in fact, their Christian roots go all the way back to the time of Christ. By the way, a century ago, about 20 percent of all Palestinians were Christian. Today, that number’s down to less than 2 percent. And most of those live here in Bethlehem. Along with Christians, Muslims are also drawn to this holy site. In fact, for over a thousand years, a mosque has stood just across the square, facing the Church of the Nativity. It’s Friday and Muslims have gathered to pray. We’re joined by my friend and local guide Kamal Mukarkar to get the most out of this opportunity to better understand Palestine and its people. Rick: So there’s churches but there’s mosques, also, in Bethlehem? Kamal: Bethlehem is a very holy city for the Muslims as well as the Christians. For the Muslims, Jesus is their second important prophet. They also believe in Mary; they worship her. She has a whole section in the Koran justnamed after her. Kamal: Yes exactly, and that’s why she very important for them. Kamal coaches a girls’ basketball team — his stars are both Christians and Muslims…and we’re rooting them on. After the game, we’re dropping by Kamal’s place to meet his family and enjoy an evening together. It’s typical in Palestinian culture that many generations live under the same roof. We’re meeting Kamal’s mother, fiancée, his sister, and her children. After some good conversation in the living room, Kamal’s mother calls us to the dinner table. She’s cooked up a classic local stew. Rick: Hey, can you explain, Kamal, what are we having here? Kamal: We are having a tagine, which is so many different kind of vegetables: potatoes, zucchini, aubergines, and peppers. Rick: And what kind of meat? Rick: I think it’s impossible for a traveler to be hungry in Palestine. The food just keeps on coming! Woman: Yes, and you have to keep something in your plate, ’cause if you don’t keep something in your plate — food — you’ll get another time food. Second woman: They will think that you’re still hungry. Rick: No wonder! Because I’m gaining weight. I need two airplane seats to fly home. As I’ve learned over and over, getting into a home reminds me how much people everywhere have in common. And sharing a meal gives a wonderful insight into the everyday lives of new friends in faraway places. Rick: I think this is a beautiful, beautiful welcome here. Kamal: Translated, it’s “cheers to your health twice,” like two times for your health. Rick: Two times for your health. Sahtein. Mmm, this is beautiful. It’s time to hit the road. The West Bank is small, roughly 30 miles wide by 80 miles long. Every place we’ll visit in this episode is — barring delays at Israeli checkpoints — within an hour’s drive of Bethlehem. Our first stop is Battir Natural Park — famed for its hikes through olive groves and ancient terraces. Kamal: We are in Palestine. This is Palestine, Rick. These are the biblical terraces of Battir, and we call them “biblical” because they’re over 2,000 years of age. My ancestors came here and carved these terraces into the mountains. It was the only way for them to survive. You know, the mountains are hilly; you need the terraces to plant on them. They did that at that time, and guess what? We exist to today. We’re still here. Only though them. That’s why I love this place. This tells me, this is where I belong. Tells me this is Palestine. Kamal: Olives, they’re the best trees. They’re the poor man’s tree. ’Cause the olive tree gives without taking. The olive tree gives us the olives without even needing us to do anything for it. In nearby villages, families take their olives to the communal press to make oil. The ancient technique survives — though boosted by hard-working machinery — as a busy crew in oil-soaked shirts meets the demands of the harvest season. Rounds of olive paste are pressed into a weeping mass. The fresh oil, after filtering, becomes a golden liquid poured into jugs to be taken home. As if rising out of those ancient olive groves, the ancient town of Hebron, with over 200,000 people, is the largest city in the West Bank. And it’s the bustling commercial capital, with nearly a third of the entire West Bank economy. Just strolling the streets, dodging cars, and mixing with the people, I feel the energy of an economy that seems primed to grow. Commerce spills out everywhere. Exploring the market streets, I’m immersed in Palestinian life. Experiences like these are why we travel. Along with all the market activity and commerce comes high security and tension. That’s because this city has the tomb of Abraham, so sacred to both Israelis and Palestinians. Here, Jews live literally atop Palestinian Muslims as the two communities struggle to be near Abraham’s tomb. While the city is mostly Palestinian, a determined community of several hundred Israeli settlers have staked out the high ground, living in a settlement above the market. The tension between the communities is illustrated by a wire net that protects the Arab food and clothing market below from the garbage of the Jewish residents above. Israeli troops are posted here to maintain control. Turnstiles and checkpoints are a way of life. A no-man’s-land with Jewish political art decorating closed buildings divides the two communities. And it’s all about this very sacred and complicated site: an ancient structure capped by a medieval church, which now functions both as a mosque and a synagogue, holding the Tombs of Abraham and his family. On one side of the glass Jews worship in the synagogue — the second most holy place in Judaism. It’s enlivened with singing, studying, and praying among the tombs of their great patriarchs. And the other half is a mosque — where Muslims worship before their shared patriarch with equal fervor. Its exquisite mimber — where the imam stands to give sermons — is a rare original from the 12th century, with inlaid wood and no nails. Unfortunately, this holy place’s history has a tragic aura. For centuries, Jews were generally not allowed to worship here. Then, after the Israeli victory in the War of 1967, the space was shared by Jews and Muslims. But during a Muslim service in 1994, an Israeli settler entered here with his gun, and killed 29 Palestinian worshippers. Since then, this holy space has been divided — emblematic of the difficult challenges that permeate the Holy Land. From Hebron we drive north. It’s fall, and the landscape is pretty brown after a scorching summer. Today’s vistas feel timeless — in fact, I can’t help imagining Abraham, Jesus, or Mohammad traversing these same valleys. As a tourist zipping from Palestinian city to city on fine modern highways, it’s easy to underestimate the complexity of this region. Palestinians in the West Bank are living under an Israeli occupation. Israel has granted sections of the West Bank various degrees of autonomy. Palestinian cities — with most of the country’s population — are generally Palestinian-run, with their own security forces. But these islands of relative independence are surrounded by zones controlled by the Israeli military. Along with most of the land in the West Bank, Israel also controls most of the roads and the traffic. Palestinian cars have green plates. Israelis have yellow plates. If there’s a problem or unrest, Israel can activate checkpoints like this all across the country and stop all traffic in the West Bank. Within minutes they can lock down and isolate every Palestinian city. Things are pretty peaceful during our visit, and we’re able to move fast and free, even with our green plates, throughout the West Bank. The Judean Desert offers dramatic and evocative scenery. Hiding in folds of the vast Judean Desert are monasteries, which, since ancient times, have given hermits the isolation of their dreams. The dramatically set Monastery of St. George welcomes pilgrims and tourists alike. For 15 centuries, the faithful have ventured to this remote spot, hiked into the ravine, quenched their thirst, and nourished their souls. Traveling deeper into the desert, our ears pop as we drop below sea level. We’re passing through Jericho. Dating back some 10,000 years, it’s one of the oldest continuously inhabited cities on earth. The main square is a delight to explore. And, with the thick air that comes with this low altitude — we’re nearly a thousand feet below sea-level — its bananas, melons, and dates are famously tasty. Rick: Oh, you have dates? From Jericho? Rick: So, what is this, here? Produce vendor: This is fresh dates. Produce vendor: Yeah, fresh dates. Rick: And this is dates…old dates. Produce vendor: Also fresh; this is for taste it now. Rick: Whoa — that is sweet! A sweet date. I like that. The road ends where the Jordan River does: at the lowest place on earth, the fabled Dead Sea. For Palestinians there’s no free access to seaside, riverbank, or lakefront in the entire West Bank. Israel re-drew the border to control the entire Dead Sea shoreline. But, when tensions are low, Palestinian families who can afford the admission are welcome to enjoy Israeli Dead Sea resorts. The Jordan River continually empties into this particularly dreamy-at-twilight inland sea. Because there’s no outlet for the water, and the scalding sun causes constant evaporation, the minerals concentrate. That’s why the water is about a third minerals — about six times as salty as the ocean — and you’ll float like a cork. If you have any little cuts, you’ll sting like mad. Keep the water out of your eyes and bathe near a shower. Locals come here for the therapeutic black mud — filled with natural minerals. They count on it to keep their skin young. Whether caked in mud or bobbing in the sunset, it’s fun to bring life to your Dead Sea experience. Approaching any Palestinian city, a bold red sign makes it clear: You’re leaving the realm controlled by the Israeli military, and entering an area controlled by Palestinian security. Israeli checkpoints are sometimes manned, or sometimes empty and a simple drive-through. Regardless, there’s always an element of uncertainty. And a watchtower reminds those coming and going that Israel is keeping an eye on things. This tower marks a checkpoint between Jerusalem and Ramallah. Stalled and frustrated drivers have plenty of time to ponder political art. Paintings on the wall like this are the voice of an occupied people who aspire to a homeland where they can live their lives freely. I find people living difficult lives are expert at coping — whether through hero-worship, venting with a spray can, or dark humor. The city of Ramallah is the de facto capital of Palestine. While most Palestinians consider Jerusalem their rightful capital, so do Israelis — and sharing Jerusalem seems unlikely for now. So, that leaves Ramallah to host the Palestinian government and international agencies. Adjacent the president’s headquarters stands the tomb of Yasser Arafat. Nearby, at Birzeit University — with its beautiful campus and 10,000 students — you can feel the energy of a younger generation working hard for a stable and prosperous future. A stroll through the campus gives me a chance to connect with students, and learn a bit about their culture. Rick: In a university like this, are there more men or more women studying? Second student: Yes, we can do everything together. We can go out together, and no judgments, nothing. Third student: To have, to have all your family around, to go abroad whenever you want. Student: I hope to live in peace, to live freely. Students: Insha’Allah. Yes, thank you. Insha’Allah. The city of Ramallah is filled with the same youthful and positive energy I felt at its university. Whether coming together at the Square of the Lions or browsing along a stylish shopping street, Ramallah helps me envision a future with a peaceful and prosperous Palestine. The most gratifying part of my work as a travel writer is to find places that defy my preconceptions. And Palestine does just that. Mixing the difficult realities of this region with the resilience and spirit of its people makes travel here an unforgettable experience. I’m Rick Steves. Until next time, salaam, peace, and keep on travelin’.